Here we describe how to setup OpManager with SMSEagle for SMS notifications. 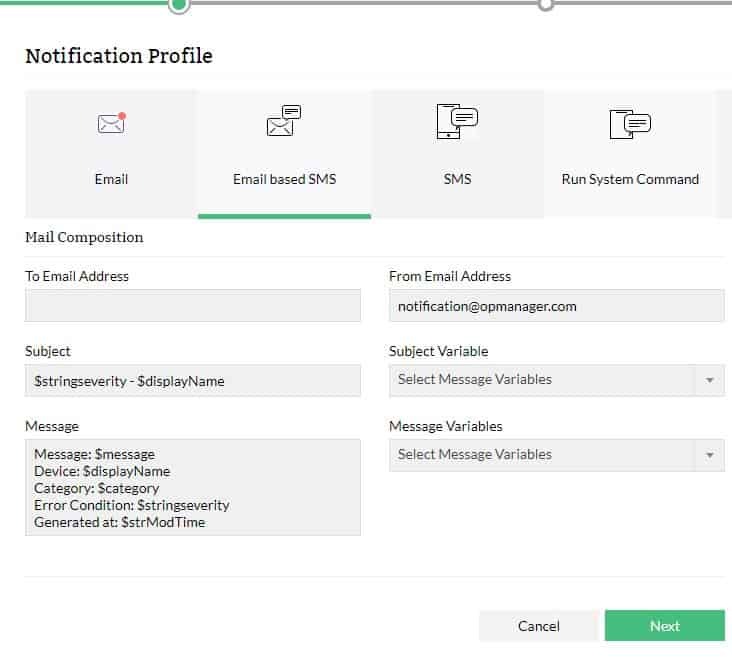 OpManager integration uses Email To SMS plugin (see details: Email To SMS plugin). Under the Admin tab, click Mail Server Settings. Enter the SMTP Server name as IP address of SMSEagle and Port number as 25. Configure the From and To Email ID fields. Enter a Time Out interval. Configure the User name and Password details, if the server requires authentication to send e-mail (optional). For SSL authentication, select the SSL Enabled check-box, browse and select the SSL certificate and key-in the password (optional). To test the settings enter the Email ID and click Test Mail. This e-mail ID will be considered as the default To Email ID while creating Email and SMS notification profiles. If you have a secondary mail server in your network, select Add a secondary mail server and provide the details. In case of failure of primary mail server, OpManager uses secondary mail server to send e-mail and SMS. You can configure OpManager to send SMS to network administrators whenever a fault is detected in the device. You can create separate profiles for each administrator and assign them to devices so that whenever a device has trouble, depending on the trouble, SMS is sent to the technician concerned. 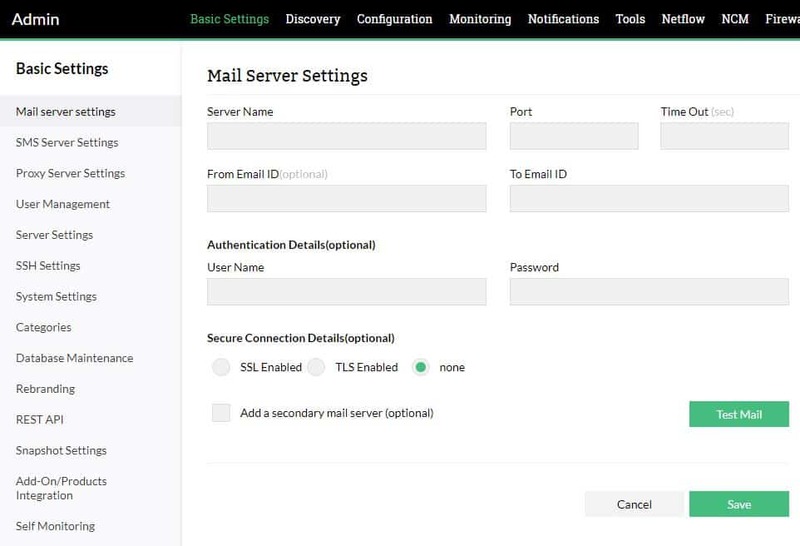 Configure the Mail Server Settings if you haven’t configured yet. Under Alerts, click Notification Profiles. From Email-based SMS column, click Add New. Assign a meaningful name to this profile. Type valid To and From Email addresses. Select the required alarm variables that you would like to see in the sms alert. Associate the profile to the required devices. This triggers alerts when faults occur. Note: Primary and secondary SMTP server settings can be provided in the Mail Server Settings page in OpManager. Whenever a new SMS profile is created, the values of the primary SMTP server and the authentication details will be considered from the Mail Server settings. Refer to Configuring Mail Server Settings for steps to enter the details. If the SMTP server is not available while sending e-mail, secondary mail server will be used to send the mail automatically. where login and pass variables are username and password for SMSEagle user you just created.